The Institute of Transport and Communications has developed and introduced Quality Management System ISO 9001:2008 since 1st of May 2010. 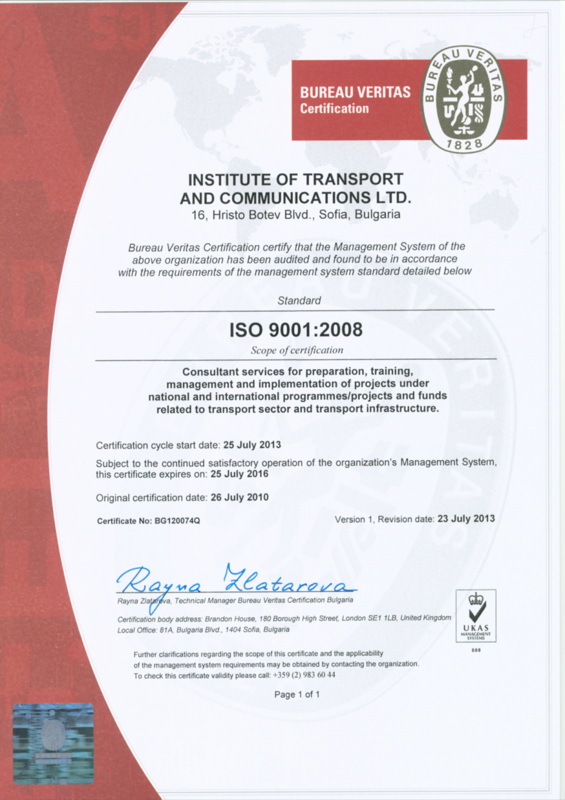 The certification audit was on 16th of July 2010 and the lead auditor from Bureau Veritas Certification concluded that the organization has documented its management system in line with the requirements of the standard ISO 9001:2008 and demonstrated the ability of the system to achieve requirements for services within the scope and the organization’s policy and objectives. As part of CIVITAS project – Measure 1.4, ITC team elaborated document “Study on the institutional and financial condition for busses conversion and alternative fuel use”. On 70 pages the team makes review of different types alternative fuels, their use in transport sector, possibilities for supplying Gorna Oryahovitsa with alternative fuels and their use in city Public Transport. Based on this document CIVITAS project working team has chosen CNG as alternative fuel for retrofitting busses of Gorna Oryahovitsa Public Transport. During the period 9th – 12th March 2010 Gorna Oryahovitsa hosted the regular meeting of RENAISSANCE Consortium partners from CIVITAS Plus project. The event was divided on two parts – two-day working session of consortium partners and two one-day workshops with participants from other Bulgarian Municipalities. Institute of transport and communications performed the leading role from Bulgarian side. ITC representatives made presentation on Gorna Oryahovitsa Sustainable Urban Transport Plan and were moderators of two breakout working sessions. The TRACECA Atlas has been produced under the project EUROPEAID “Strengthening of Transport Training Capacities in NIS countries (TRACECA)”. It is part of the training materials developed in the field of transport planning, investment appraisal and multimodal transportation and interoperability. Ukraine, Moldova, Romania, Bulgaria, Turkey, Georgia, Armenia, Azerbijan, Turkmenistan, Uzbekistan, Kazakhstan, Kyrgyzstan and Tajikistan. The atlas has been developed by a team of NEA experts in close cooperation with NEA Central Asia, NII TK Kazakhstan and the Institute of Transport and Communications (ITC) in Bulgaria with the support of the Permanent Secretariat of the Intergovernmental Commission TRACECA in Baku. The data presented and forecasts provided are derived from the NEA database and are the full responsibility of NEA. 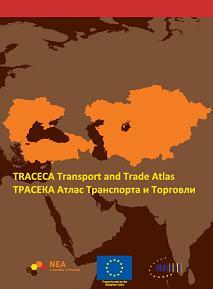 This atlas provides an overview of the different trade and transport issues in the TRACECA area. The atlas is structured in themes. These themes comprise trade and transport flows, transport policy, transport chains, intermodal transport, logistics, operational procedures, external effects and further issues. The Institute of Transport and Communications started working on the EC DG TREN ambitious ETIS Plus project to design and build a European transportinformation system in September 2009. The project is being implemented by a consortium of 18 prominent transport consultant companies from Belgium, France, Germany, Greece, Denmark, Italy, the Netherlands, Poland, Portugal, Slovakia, and ITC from Bulgaria, leaded by NEA Transport research and training. The project aims at producing an online database of harmonized European data. It will run until 2012, and will ultimately provide data on the year 2010 for important European data models such as TRANSTOOLS and TREMOVE. Construction of passenger data set. Innovative and cost effective methods for collection data in Accession countries and Neighbouring countries WP, leaded by ITC, will handle the specific needs of these countries in moving towards databases with European standards. Efficient cost effective methods are necessary to fill data gaps and to improve the quality. Methods will be proposed and – to a certain extend – tested within pilots. Moreover, the institutional organization of data collection related to transport policy objectives will be assessed and based on benchmark with improvements proposed and tested.